The list below gives an indication of our current stock of pond and coldwater fish, but please note that this can change weekly! If you will be travelling a long way to visit us for a specific fish, please call first (01773 861255) to confirm that it's still in stock, and we can reserve the fish until you arrive. 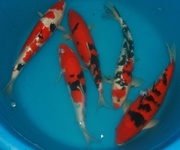 Now in stock - High-Quality Hand-Picked Israeli Koi at very competitive prices! Please note that we do not ship fish, but we can pack them for a road journey of several hours if necessary. Through the winter months, we maintain only minimal stocks of pond fish, but we still have Goldfish, Shubunkins, Orfe and Koi in stock, as well as British native fish. 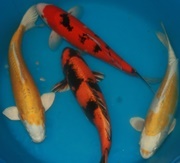 In addition, we have a superb range of good quality Coldwater Fancies in stock, including several varieties of Oranda (Orange, Red & White, Chocolate, Tricolour, Red Cap), Black Moors, Panda Moors, Red & White Ryukins, Black Ranchu, Lion Head Ranchu 'Jet Black' etc.